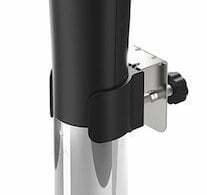 This is an average quality model that suffers from bad pricing, the Anova Bluetooth Sous Vide or Wancle Sous Vide SVC001 would be a much better choice. $79.99 Current Price - YOU SAVE $43.84. This is an average quality sous vide model, that suffers from frequent stock issues and wild price swings. 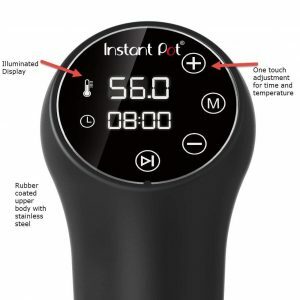 This really isn't a good value purchase, we recommend the Anova Bluetooth Sous Vide or Wancle Sous Vide SVC001 instead. This model is 12.9" in height It has a high impact polycarbonate housing and a stainless steel tube housing for the heating unit. It has an adjustable clamp that allows you adjust the position both horizontally and vertically, this is the most flexible configuration you can have. We wanted to like this model, but the overall quality missed the mark, so we have a hard time recommending it. 12.9" 2.5" x 4.6" 11.1" x 14.8" x 4.5" 16" x 3.5" x 3.5"
The Instant Pot Sous Vide just didn't impress us, the quality was average and the pricing wasn't comparable to similarly equiped models, there are much better choices like the Anova Bluetooth Sous Vide or Wancle Sous Vide SVC001. The Anova Nano is a good quality sous vide machine that is best suited for the occasional home chef.